ASU mathematical biologist calls for new way to fight viral outbreaks. Ebola, Zika, SARS, H1N1: ASU mathematical biologist calls for new way to fight. HIV ... SARS ... Ebola ... H1N1 ... Zika. The list of communicable global health threats seems ever growing, and frequently the limited resources available to fight these diseases must be picked up and redeployed — often haphazardly — as the next new threat emerges. But what if there were ways to wage a more effective war against all communicable diseases, using new combinations of proven complex sociological and statistical mathematic models to tell where an outbreak might occur, how it might spread and how best to fight it? That’s exactly what Carlos Castillo-Chavez, a Regent’s Professor of mathematical biology at Arizona State University’s School of Human Evolution and Social Change, and colleagues are calling for in an article published this month in the Proceedings of the National Academy of Sciences of the United States of America. As executive director of the Simon A. Levin Mathematical and Computational Modeling Sciences Center, Castillo-Chavez isn’t satisfied with the traditional mathematical epidemiological approach to tracking these diseases. That model relies heavily on the number of “collisions” between those with a disease and others who aren’t infected. It often falls short because it fails to consider the unique complicating factors of what is referred to in the study as a “patch” — or a zone of shared traits, including socioeconomic or geographic similarities — where those interactions occurred. Instead, Castillo-Chavez says the intersection of two evolving approaches could potentially address the problem better. The first is economic epidemiological modeling, which includes examining information flow in affected areas and the financial risk/reward perceptions that may drive movement to, from and within affected patches. For example, someone in a patch might have to choose between self-quarantine as a protection strategy vs. leaving home during an outbreak to go to work and receive income — which can also be a matter of life and death. The second is the Lagrangian approach, which also assists with projecting human crowd movement and behavior but broadens the scope of patches considered related to a disease and allows them be assigned their own associated risk of infection per residency time. This information can then be layered over economic epidemiological modeling-driven population mobility calculations for more accurate projections. “The Lagrangian perspective has helped increase our understanding of the consequences of the deliberate release of biological agents in 2003 and most recently in the study of Ebola in West Africa and Zika in the Americas,” Castillo-Chavez noted. Both the development and the application of these types of new, complex mathematical and social theories would be no easy feat. But it might be a first step toward the goal of identifying consistent patterns — such as those starting to emerge in the study of host-parasite systems — that can account for not just known and recurrent variables, but also emergent natural and social shifts in a world where people can move anywhere, at nearly any time. "These efforts emerged as the result of multi-institutional collaborators that met regularly at NIMBioS (the National Institute for Mathematical and Biological Synthesis) in Tennessee with the support of NSF (the National Science Foundation) for more than two years,” Castillo-Chavez said. “The research has been carried out with my former students and postdoctoral associates Benjamin Morin, now at Vassar, and Derdei Bichara, now at Cal State Fullerton." Castillo-Chavez also is affiliated with the Office of the Rector, Yachay Tech University, Urcuqui, Ecuador; and in the Departamento deIngenieŕıa Bioḿedica, Universidad de los Andes, Bogota, Colombia. 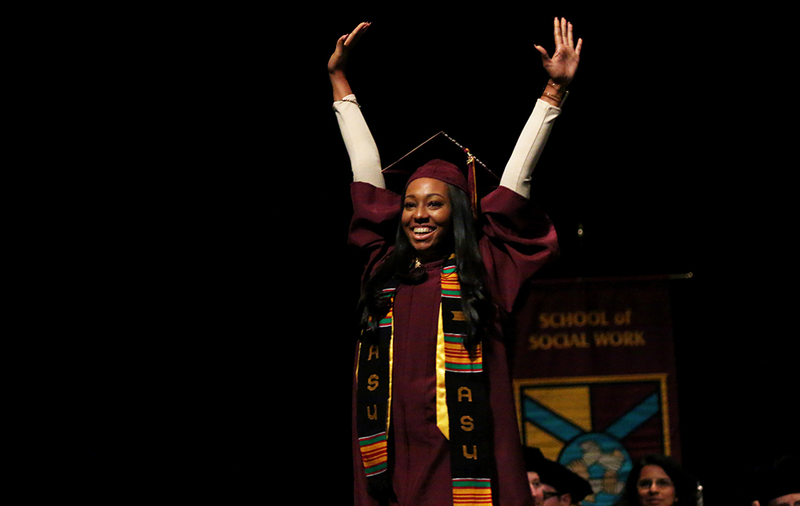 Dean Jonathan Koppell told some 330 graduates at Arizona State University's College of Public Service and Community Solutions convocation on Dec. 13 that he hoped the current political climate would not diminish their sense of optimism for work in the public interest. A political scientist by training, Koppell reminded the 5,000 people in attendance that there are legitimate kinds of fears. Fear of terrorists. Fear of cutting off Social Security. Fear of losing rights. And fear of an intrusive state. Koppell said he has a better appreciation for what Roosevelt was responding to as he took office during a time of crippling unemployment and poverty. “Now I understand his warning,” he said. “You’ve reached this day having overcome great challenges. Jonathan Koppell, dean of the College of Public Service and Community Solutions, addresses students at the Fall 2016 Convocation held at Comerica Theatre in downtown Phoenix on Dec.13. Jonathan Koppell, dean of the College of Public Service and Community Solutions, addresses students at the Fall 2016 Convocation held at Comerica Theatre in downtown Phoenix on Dec. 13. He suggested there was one other emotion that poses a significant danger. As proof, he pointed to the comment section of news articles on the internet. “If you look down at the comment sections, it will only take a couple lines before people are spewing the most vile, vitriolic, hateful things that you've ever seen,” said Koppell. He reminded students that anger would make it impossible to do any of the things U.S. Rep. Kyrsten Sinema — the ceremony's keynote speaker — suggested they pursue. “If we only feel rage and anger, then how do you listen?” asked Koppell. “If you only feel anger, then how do you empathize? Koppell pointed out that anger would not have helped them pass their tests. Sinema delivered the keynote address, discussing the polarization in the U.S.
“We face a significant challenge today. The fight between the two edges has gotten severe,” Sinema said in a soft and somber tone. “I’ve recently said that these folks on the edges — they’re pulling at the fabric of their country and they are ripping the seams. Sinema is a 1999 graduate of the college and a lecturer in the School of Social Work. She told students that those committed to public service can make a difference by trying to better understand another person’s life experiences and perspectives. Representative Kyrsten Sinema delivers the keynote address to graduates at the Fall 2016 College of Public Service and Community Solutions Convocation. A Tucson native, Sinema told her family’s story of going from middle class to a life of poverty living in an abandoned gas station. She said her family utilized government food stamps, and she relied on free school lunches and used federal grants to help pay for college. Sinema saw education as essential to leaving poverty. She was valedictorian of her high school class at age 16 and graduated from Brigham Young University with a bachelor’s degree in social work at age 18. She was employed as a social worker at a Phoenix school district before earning a graduate degree in social work from ASU in 1999. She went on to receive a law degree and a PhD from ASU. In fact, Sinema was in law school in 2004 when she ran and won a seat in the Arizona Legislature, where she served four terms. She was elected to Congress in 2012 and will soon begin her third term representing Arizona’s Ninth Congressional District. A progressive Democrat, Sinema has earned a reputation for working with members of both major political parties on a variety of issues. “There’s a conservative and a liberal narrative in our country, and often those two narratives are pushed against each other,” she told students. “The truth is that both of these narratives are true and they need each other,” said Sinema. “My whole life, my journey from homelessness to serving in the halls of the United States Congress is the combination of these two narratives. “Let it be cause for vigilance to ensure that the rights and protections — which every member of our community is entitled to — are defended and preserved,” emphasized Koppell. The dean called on graduates not to give up. Koppell reminded graduates that the nation had faced deep divisions and uncertainty in the past only to emerge stronger. He acknowledged that this kind of optimism does not diminish the real struggles ahead, only that it illuminates the hard work that remains. “Your optimism in getting here today, your optimism regarding our future is an inspiration to me,” Koppell confessed. “It's what gives me hope, and I urge you to retain it.